This simple homemade recipe kills powdery mildew safely, without harming your plants or introducing chemicals into your garden. 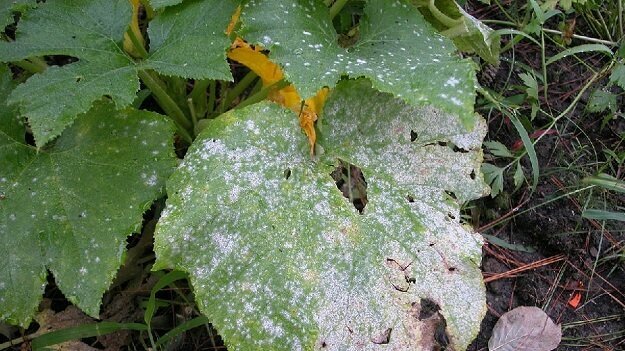 Powdery mildew is a fungal disease that often impacts cucumbers, squash, gourds, pumpkins, and watermelons. It appears as white spots or splotches on the leaves, resembling a dusting of flour. It is particularly a problem during wet periods, or on drought-stricken plants, and can kill your plants if it gets too bad. While some fungicides are effective against powdery mildew, if you’re gardening organically you won’t want to use a chemical agent. Luckily, there is a homemade cure that works very well against most cases of powdery mildew, and may also work for other fungal diseases in the garden, such as black spot on roses or grapes. This recipe is safe, non-toxic, and easy to make using common household items you probably already have on hand in your kitchen. Mix all ingredients thoroughly and keep agitated while using. Then spray plants. Use weekly until problem is resolved. So sorry to hear that! It can be bad – especially on squash… Hope the recipe works well for you! Thank you. My plants were badly affected last month. I even was forced to remove some.